I’ve gotten used to and enjoy the surprise of what we receive from our CSA. There was a time when I dreaded one more bunch of greens, but now I look forward to using every last leaf when they’re in season. Another item that I previously found challenging to use was red cabbage. I prefer it raw rather than cooked, and I’ve finally amassed enough salad and slaw options that I love finding a dark purple head of it sitting our Farmhouse Delivery box. Lately, I’ve come to especially like Asian flavors mixed into a salad or slaw with red cabbage. I usually just wing it and start mixing ginger, garlic, lime juice, sesame oil, and a little vegetable oil for dressing the chopped cabbage. But, for this most recent salad, I turned to The Fresh and Green Table by Susie Middleton. I always find great ideas for all seasons in that book, and it has yet to disappoint. 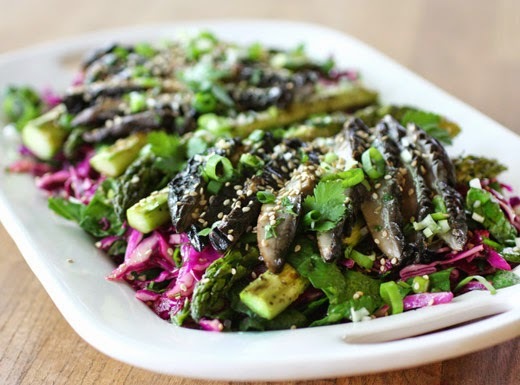 In the book, this salad is shown with grilled asparagus and portobello slices on top of a salad made with Napa cabbage and spinach. I switched it up by using red cabbage with spinach instead and loved the mix of dark purpley reds, several shades of green, the whites of the green onions, and the dark browns and blacks of the mushrooms. The marinade for the mushrooms was made first. Peanut oil, soy sauce, rice vinegar, sesame oil, minced garlic, and minced ginger were whisked together. A few tablespoons of the dressing were set aside, and the rest was poured over the mushroom caps in a baking dish. They were left to marinate for about 30 minutes. Just before cooking, the asparagus spears were added to the baking dish and turned in the marinade. I used a grill pan inside to grill the vegetables, and the portobellos were sliced after coming off the grill pan. In a big mixing bowl, thinly sliced red cabbage, torn spinach leaves, some sliced green onions, and cilantro leaves were combined. The spinach and green onions were also from our CSA, and the cilantro was from my herb garden. To the bit of reserved marinade, lime juice and some soy sauce were added, and most of that was poured over the raw vegetables. It was tossed with the cabbage and spinach mixture before transferring the salad to a serving platter. The grilled asparagus was set on top followed by slices of the grilled portobellos. The remaining dressing was drizzled over top, and more cilantro leaves, sliced green onions, and sesame seeds were added for garnish. The flavors were as good as I knew they would be, and I loved that the mushrooms and asparagus made this a meal of a salad. There was a great mix of textures and temperatures between the crunchy, cool, raw vegetables at the base and the warm, grilled top layer. I’m not sure if we’ll see another head of red cabbage in our CSA box this season, but if we do, I’ll be delighted. Beautiful, colorful, healthy and tasty! This salad is perfect. 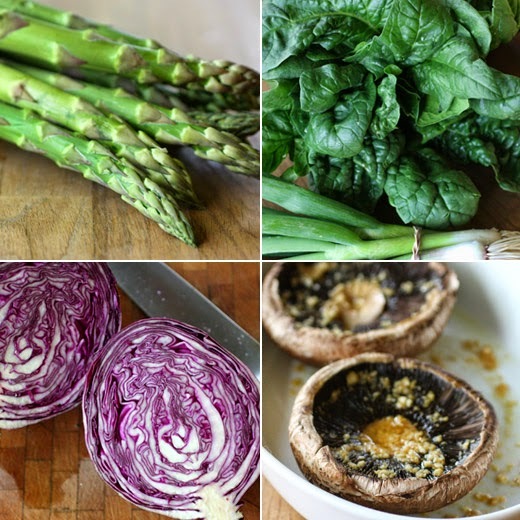 A great combination of spring and winter veggies. Looks divine! I love those marinated mushrooms.. I am sure this salad was very delicious! This is one gorgeous salad. I love the change of using red cabbage to mix it up. Such a nice salad! I'm a big fan of Asian flavors in salads and slaws too (cabbage-based or not). And we have a ton of spinach in our garden at the moment, so this is really timely! Thanks so much. i have trouble liking asparagus, but i've never tried it grilled. plus, your marinade sounds awesome! I also love Asian flavors in salad dressings, so this one is right up my alley. Such striking colors and textures in this pretty salad! Wish I had some right now. I live that this recipe is hearty enough to serve as a main dish. All that lush, fresh flavor will keep my resident carnivore happy without any meat in sight! I like this so tasty and healthy salad Lisa! It sounds so yummy! Not only is this a great healthy salad but it's beautiful! Look at that color! 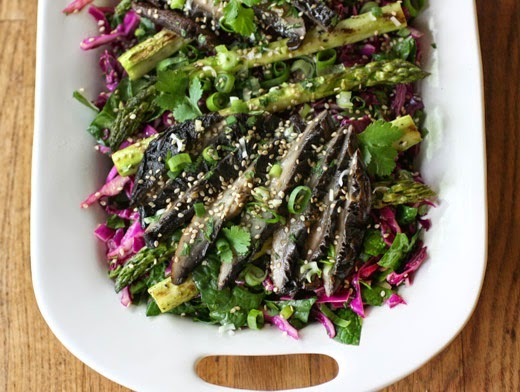 Love the mushrooms + asparagus in the salad. These are my two favorite things to cook this spring! The salad has all my favorite ingredients and it sounds ideal for the weather here. I normally don't get too excited about raw cabbage but how could I NOT after seeing this beautiful salad! Are there any measurements for anything for this dish? Thanks! I'm sorry, but I don't reprint recipes from books without the publisher's permission. Fabulous!! Beautiful flavors and perfect with the grilled vegetables. Inspiring, really.